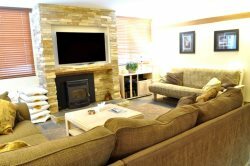 This is a first class vacation rental with lots of light, beautiful mountain decor. It is a nonsmoking, two bedroom unit with two bathrooms . It has a full kitchen with gourmet amenities, a microwave, fireview woodburner, 2 flat screen TV's, and a DVD player. This unit has a 1-car garage and 1 outside space.